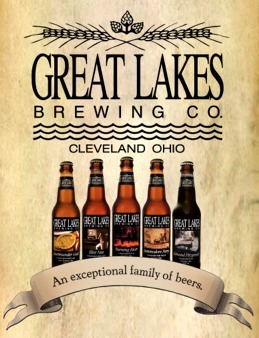 It’s no secret that in the summertime, my preferences generally turn to lighter beers, shandies, and the like. Like a lot of people, the combination of increased thirst and hot weather make me less apt to turn to heavier dark ales, stouts and porters—or beers with higher alcohol content. If I’m in the pool or at the Tiki Bar, I’ll probably go with a Corona, a Radler, or a simple Lager-and-Lemonade. Occasionally, a berry beer of some type (always liked Abita’s Purple Haze) may suffice – and I was intrigued with a recent trial of Shiner’s Prickly Pear. Since our backyard pool area has a pretty solid Tiki vibe going on, I couldn’t resist the opportunity to sample Rivertown’s Hala Kahiki* Pineapple Beer. It’s actually one of the few craft beers that I’ve purchased in a can, aside from a six pack of Cellar Rats/Hopview Bernie Beer I enjoyed last Fall. The Hala Kahiki can looked fun, and I like pineapple…so it seemed like something worth a try. And try it we did. What Hala Kahiki offers is a very, very light ale, with a sweet, fruity taste that goes down very easy. It is indeed very refreshing, and you could probably enjoy a lot of it on a hot summer’s day. That said, I would make two important observations: 1) it is a very light tasting ale – (read “light-beer” light) with no hop bitterness. That’s’ okay by me, but without the fruitiness, the ale would have little character on its own. 2) The pineapple flavor is there, but it is also very light. That may be a good thing, but it struck me that if I was blind testing this stuff and was asked exactly what fruit I was tasting, I might not be so sure. 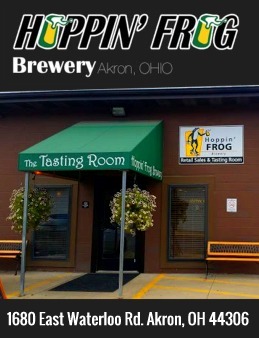 In truth, the Kahiki’s flavor pales beside something like Hoppin’ Frog’s Turbo Shandy—which is a rich, golden ale with a clean, natural lemon flavor component. But then, the Turbo Shandy is at least 7 bucks for a 22oz bottle; you’d want to drink a lot of it, but you probably couldn’t afford it. To sum it up, Rivertown’s Hala Kahiki is probably a good choice for any hot summer day. I would buy more of it (in fact, I just did today before I penned this post) since it’s easy to drink and offers a fun alternative to the typical summer shandy. Definitely worth sampling. 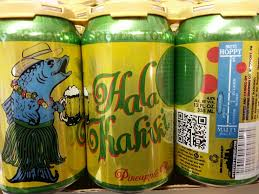 *According to the marketing blurb on the can, the name "Hala Kahiki"(hahlah-kah-hee-kee), originates from the Hawaiian words for pineapple.